Finding Bathroom Water Damage | Sincerely Yours Inc.
Water damage in the bathroom is almost inevitable. From overflowing toilets, sinks, and bathtubs to broken pipes under the sink, water is always going to find its way from where it should be to where it shouldn’t be. Water damage in your bathroom can result from major floodings, like when a pipe bursts, or toilet water will not stop spilling over, but it can also come from minor problems like slow water leaks. However big the water damage is, if you live in Irmo, Sincerely Yours is fully equipped to come in and clean it up. And they have techs on call around the clock so if a pipe breaks in the middle of the night, we will be there fast! In the age of “do-it-yourself” projects and living minimally, many people want to tackle major home and business repairs on their own. Most people believe that if they do it by themselves, it will save money. But, when it comes to water damage, it will save money, in the long run, to invest in a certified and insured water damage restoration company that knows the best cleanup and repair techniques and has the proper equipment to clean up a water disaster. For instance, if your bathroom has been flooded because a pipe burst and it took a long time to shut off the water to the pipe, you need water extraction tools and industry sized drying equipment to make sure the floor and other wet areas are dried fast enough that mold does not become an issue. Towels and a couple of loose every-day fans are not going to dry the wet areas quick enough. You always want to call in a professional team to make sure the situation is handled correctly. Like any professional restoration company, Sincerely Yours has extensive training, education, and experience cleaning up and repairing all kinds of water disasters. Because the bathroom is so prone to water damage and mold, you need to make sure that it is safe and protected if water has damaged the integrity of the structure. Sincerely Yours has certified mold remediators that can find mold at the source of the problem and eliminate it for good. That means that if something like a slow leak that has gone undetected for a long time has caused mold, you don’t need to call in ANOTHER team to clean up that mess. Sincerely Yours can do it all. Many times, the bathroom water leaks can spread to other areas of the home or business. So even if you think that you know where the problem extends to, you might not actually know. Professionals like Sincerely Yours will know how water damage spreads and where it is most likely to go. Don’t try to find DIY methods on YouTube that are going to end causing a bigger problem and costing more money. 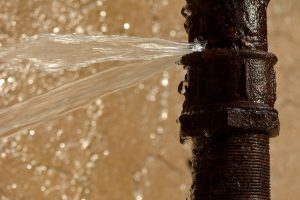 Sincerely Yours in Irmo has 24-hour water damage cleanup specialists on call so that your unique water situation can be handled immediately.